Green refers to a product that contains less than 100 VOC (Volatile Organic Compounds). VOCs may be natural or synthetic. Like organic chemicals, there are millions of different compounds which may be classified as VOCs. The nose detects strong smells generally as a something containing high VOCs. Modern industrial chemicals such as fuels, solvents, coatings, feedstocks, and refrigerants are usually VOCs. As organic chemicals, VOCs may have health consequences, but this is depending on the specific chemicals that are being used. Because of their health effects, VOCs are regulated in some places. Many consumer products found around homes, such as cleaning solvents, paints, and wood preservatives on certain furniture all emit VOC compounds. In recent years many common materials and products used indoors have been developed and are labeled by manufacturers as low VOC or zero VOC. Where to buy Eco Friendly or green paint with low or zero VOCs. EnviroSafe has been manufacturing products that are low in VOCs since 1976. Their wall paint contains ZERO VOCs. We now offer their paint because of their safety and for the convenience of our customers. Since the paint is drop shipped directly to your home or business, you save time and money. For now, we offer the paint in quart sizes only. Since the colors are used mainly for mixing with a glaze, a quart is enough. For the base coat, you can purchase a gallon of paint at your local paint store. A lot of the colors are included in the Faux Painting Color Suggestions and Idea E-Book that we include FREE with the purchase of any of our faux painting kits. You can also buy low VOC paint from Valspar's Signature brand at Lowes or Duration brand at Sherwin Williams. Visit our faux painting store to purchase our sample paint kit which includes 1 quart (32 oz) of Floetrol (paint conditioner which is used as a glaze, 6 bottles of Low VOC wall paint (7.2 oz.each) and 1 bottle of glycerine. Floetrol glaze contains only 40 VOC which is also considered a green product. 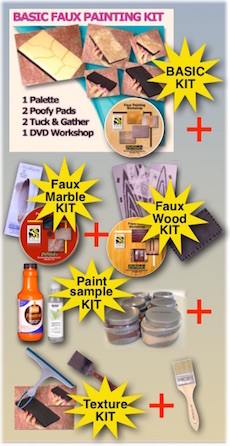 This kit contains the perfect amount to begin practicing and enough to even faux paint a bathroom or small bedroom. If you decide you like the products, you can purchase the paint from our site and purchase a gallon of Floetrol at Lowes or Home Depot. What paint sheen should be used for faux painting? For your base coat, use a satin sheen. Eggshell is fine but you will have less open time. We recommend using regular wall paint to mix with your glazes, too. Use 1 part paint to 6 parts glaze. You can choose to use universal tints or acrylic paint in a bottle to make your own colors if you are an experienced faux painter or artist. Getting started with learning faux finishing. 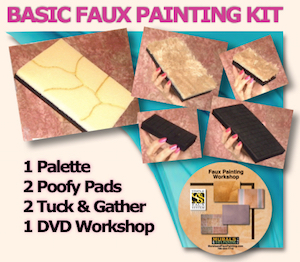 Our Basic faux painting kit, INCLUDES one Multi Color Faux Palette, a set of Poofy Pads, a set of Tuck and Gather tools PLUS our Faux Painting Workshop DVD. Receive FREE, a Faux Painting Color Suggestions and Idea E-book-book, too. It's now on sale for only $39.99 for a limited time. 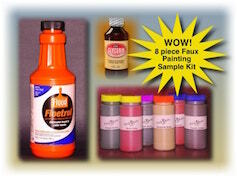 We have articles about faux painting which can be a source of help.